Apollo Inffratech is a leading manufacturer that has been providing excellent concrete solutions for builders and construction contractors. Buying construction friendly components from expertise manufacturer will help the investors and contractors to experience efficient production. Ready mix Concrete devices are manufactured in various sizes and functionality. visit http://www.apolloinffratech.com/about_us.html to more information about Ready mix Concrete plant. 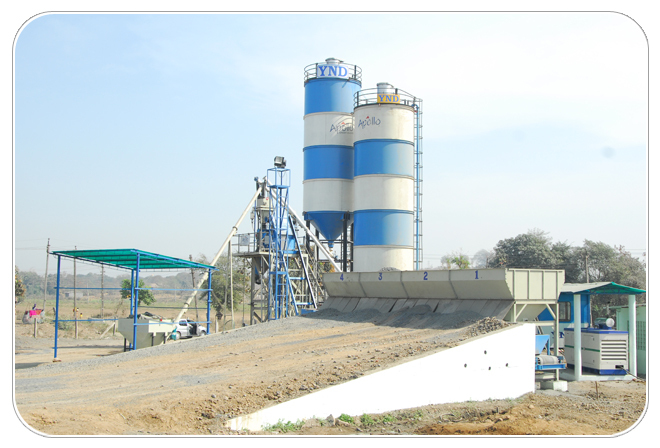 Apollo Inffratech’s concrete batching plant ATP 90/120 is an excellent solution for higher productivity requirements. They are manufactures Transit mixers, hollow slab making machine, compact concrete batching plants, etc which pave way for quick work progress. Concrete batch plants and processing technologies have continued to grow overtime due to rising demand for concrete by commercial and real estate construction. The current type of machinery and technologies used by these plants has continually improved to cater for high demand and ensure that aggregate, binders, additives and admixtures are thoroughly mixed. Concrete mixing plants have been developing over the years. Before the invention of the concrete mixer, concrete was mixed manually by construction workers. The first concrete mixing machines were self loading. In the 20th century self loaded mixers were driven by steam to increase their productivity. Due to increased productivity new better concrete mixers were developed. These had tilting mechanisms, reverse discharge system, double cone mixers and other features which improved the process of feeding the concrete, discharge and mixing. Compulsory concrete mixers developed later on. These were vertical spindle and horizontal shaft concrete mixers. These would take high loads of materials and produce high outputs needed for the rising construction needs. As production increased, large concrete batching plants were developed. These plants have many advanced features, computerized control, improved mixing and efficient energy consumption. They incorporate storage of raw materials and batches to hold ingredient when being mixed. Many operational features of these plants have been improved in response to the ever increasing need for increased productivity and uniform mixing. Current machines must be able to mix aggregates, stones, sand, bidder, admixtures and other chemicals in the right proportion. This necessitates the use of sophisticated batching plants. Subsequently, specialized plants have been developed. Some common plant types include compact, combined, horizontal and vertical type of plants. Current batching plants are specially designed for use in specialized operations such as commercial concrete batching plants, ready mix, belt type and mobile batching plants. These plants have the capacity automatic weighing system to accurately determine water, aggregate, sand, bidder and other chemicals. Automatic weighing aids in accurate determination of the materials which improves the strength of concrete mixture. Concrete plants developments have resulted to the introduction of computerized control. Modern commercial plants have dynamic displays, sensors and other control devices which ensure accurate feeding and mixing processes. These controls enable the operator to carefully plan and execute the production process. Modern plants have crew conveyor for feeding material to the batching plant. Plants also have many hoppers, twin shaft composury mixers and cement silos. Recently mobile concrete batching plants have been developed. These are compact in nature to allow for easy transportation. They have high degree of automation and can be used for remote sites where small and medium sized projects are being constructed. The use of concrete batching plants has grown both locally and internationally. Local and international batching plants have similar features though international batching plants have better automation and computerized control features. 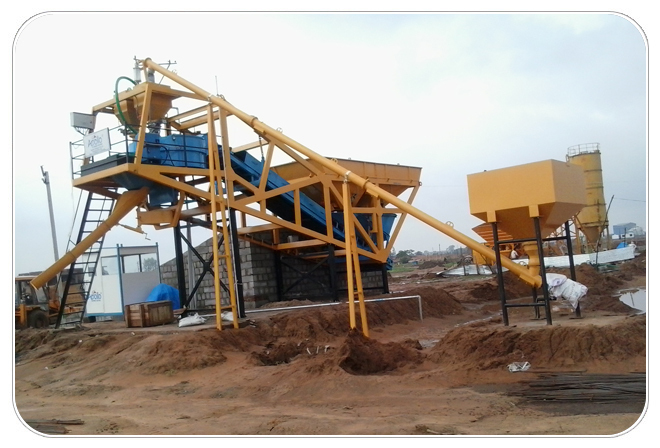 Concrete batching plants have developed from simple self loading mixers to the current high tech plants. Modern day plants have high processing capacity and yield high quality concrete. Concrete is one of the widely used construction material in the world. Road, buildings and other numerous structures use concrete as a fundamental material in the construction of support columns, walls and floors. It is mixture of aggregate or course materials such as gravel or crushed rocks mixed with binding materials such as cement and sand. The ratio of gravel, sand, cement and water varies and determines the strength and durability of the structure. Other additives such as fly ash, chemicals, minerals and silica are also added to increase its compressive strength, ability to harden and workability. Because concrete has low tensile strength, steel reinforcement bars are used during construction. Concrete batch manufacturing process is a modern method of producing high quality concrete for specialized applications. In the batch process, concrete is prepared, mixed and transported to the site using specialized equipment and trucks. The batch process has a concrete mixer and specialized trucks for transporting the materials to construction sites. The batch mixer produces ready mixed concrete plant based on the structural engineer requirements. Batching plants are mainly classified as ready mix of central mix plants. Ready mix plants mix all the materials except water while central mix plants provide concrete with all materials plus water. Concrete batching plants have the capacity to produce different mixtures of concrete based on the design and engineering requirements. Concrete plants have mixers, batchers, aggregate bins that enable the plant operators to vary concrete ratio and achieve the desired structural properties. Careful addition of chemical and mineral admixtures as well as varying the ratio of aggregate, sand and cement produces special concrete suitable for most modern structures. Ready mix concrete is advantageous as compared to onsite mix as it is mixed according the desired ratio. This ensures that concrete has the desired structural strength, workability and durability. Batch manufacturing plants have advanced mixers which ensure that the concrete is uniformly mixed. Common mixers include twin shaft, tilt and pan mixers. The already mixed concrete is inspected to ensure that it’s of high quality and is uniformly mixed. Batch processing plants have advanced and computerized systems. These systems include automatic weighing systems, PLCs, conveyors, heaters and chillers. This makes the production process very fast, accurate and produces a uniform and consistent mix. Unlike on site mixing, the production and transportation of concrete is done under a controlled environment. This prevents physical and chemical change of the mixture and ensures that setting, compaction and curing processes occur as intended. Mixing concrete at these plants prevents the dangerous and harmful dust from sand and cement from affecting workers and causing environmental pollution at construction sites. Batch concrete plants are used to produce high quality concrete mixtures made according to the engineer’s recommendation. Alteration of the mixtures per batch enables the production of special concrete suitable for different structures. The process is fast accurate and produces high quality concrete.